In Pano2VR, you can create and add a skin to your HTML5 outputs. 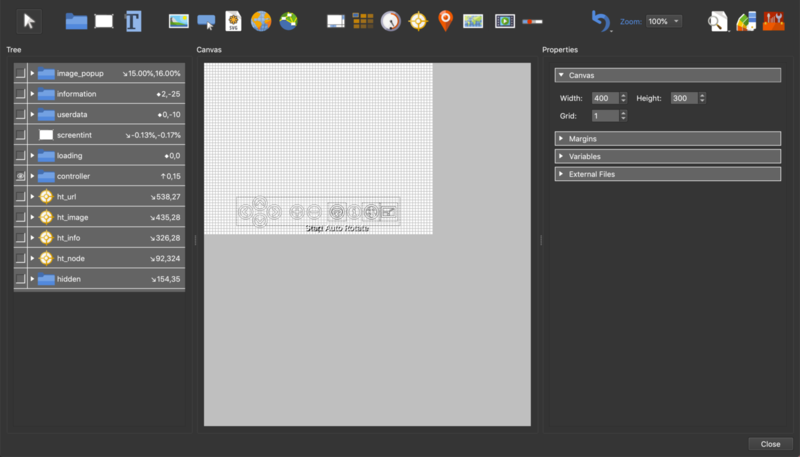 The Skin Editor has 4 main sections: the Tree, the Canvas, Properties and the Toolbar. Click the Skin Editor button in the HTML5 output panel. Above this button, you can choose from a selection of built-in skins. Add elements to the skin. These can be buttons, images, SVGs, sounds, videos or external elements. Pano2VR ships with fully functioning skins that you are free to use for your projects. You will find these skins in the Skin menu of the HTML5 output settings. Hide the Tree and Properties with the keyboard shortcut, Shift-Alt-Tab (win) or Shift-Option-Tab (macOS). First, select an element in the Tree to enable navigation. Use the up/down arrow keys to move up and down the Tree, activating elements as you go. Use the left/right arrow keys to open containers. Once an element is selected, use Tab to move to the Canvas. Hit Tab again to return to the Tree. Pano2VR will save skin files every ten minutes. If the program closes unexpectedly and the current skin was not saved, the next time Pano2VR is opened, it will give you the opportunity to open the last auto-saved skin file. Once that file is saved, the file path will return to the original file, rather than in the auto-save folder.